I've been growing increasingly skeptical of Ubisoft lately; they lost me with the Assassin's Creed franchise, Watch Dogs doesn't appeal to me, Rayman Legends had some really dreadful sections (though some of that game is amazing) and while so promising, Child of Light was a repetitive, simple and boring game with god awful dialogue. 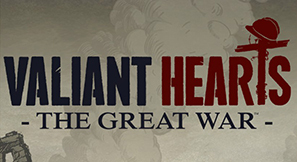 I've played through the first hour of Valiant Hearts: The Great War and I'm happy to say I've got nothing but positive thoughts about the game. 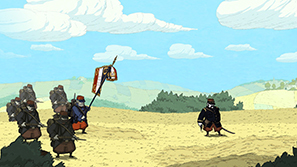 Valiant Hearts was made in the same engine as Child of Light and looks equally beautiful. The hand drawn art and animations create an aesthetic that is a wonder to look at. In the first hour you change location frequently; from rural fields, snowy bases and areas ravaged by the war. 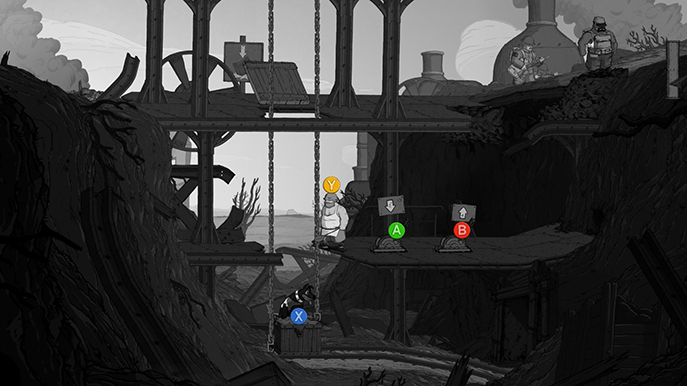 There are frequent changes of pace in the gameplay. At one point you need to cook sausages for the generals, at another you are running through fields avoiding mortar and gun attacks with your fellow soldiers falling all around you. It comes as quite a shock when everything changes and you are running for your life. Historical wars are mostly represented in video games in first person shooters, where you essentially shoot everyone and win the war. While this may be somewhat of a generalisation, it feels true to me with the games that I've played. 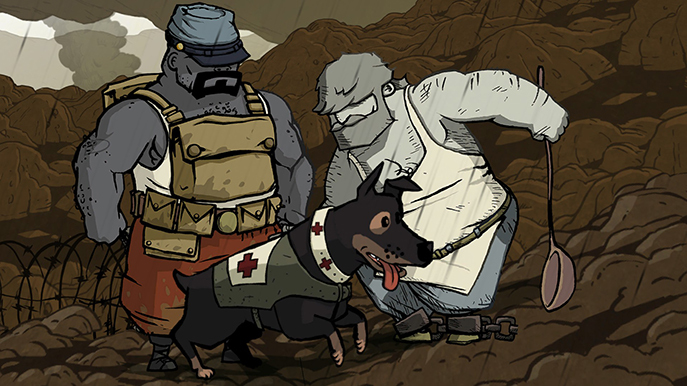 Valiant Hearts has a completely different way of conveying the war. There are narrations of the events of World War One that are happening at the time in the game and text discussing items, areas and battles accompanied with photographs in the menu (with unpleasant large Facebook and Twitter logos just to the right of these pieces). You are not here to shoot people. Instead, you are drafted and need to help other people. 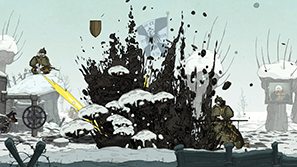 In terms of gameplay Valiant Hearts is a 2d puzzle adventure game. You can carry one item at a time and either throw it, attach it to something or give it so someone. This ranges from throwing bottles to hit a bell, using dynamite to clear a path or using a bone in a mechanism as a makeshift lever. The puzzles so far have been enjoyable but relatively simple. There are multiple playable characters in the game. So far I've encountered two. Each character has an ability, the father can dig, the American can cut wires. You also encounter a dog that attaches itself to you after an event. Animal companions can create a swift emotional attachment in games and this is true here. You want to protect it and make sure nothing bad happens to it in this harsh environment. You don't take direct control of the dog, rather, by pressing RB the screen goes black and white and button prompts appear over items it can interact with. This method works well and I was able to instruct the dog with no problem. There is a real atmosphere in the game. You are aware of the dangerous setting and when separated from other soldiers there is a sense of loneliness; relieved a little by your canine companion. The narrative is personal; while it does give you an overview of what is happening in the war it concentrates on the tribulations of the playable characters: their families, their situations, their histories. I am greatly intrigued to see where the narrative goes. 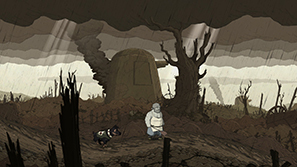 Valiant Hearts: The Great War is very promising. The first hour that I've played was a real joy. The sombre setting is handled responsibly and while the gameplay wasn't challenging, it was engrossing and enjoyable. The OST deserves a mention too. It accompanies your experience well; particularly notable when I was alone with my dog. It really hit home the sense of loneliness in that section. I can't wait to play more and I really hope that it continues with the high standard of it's opening hour.